This is the railway cutting in which Transport for London's (TfL) works are on track to deliver the new Dalston Junction station in 2010 as part of the East London Line extension (ELLX) in Hackney. Although the ELLX is a significant investment in Hackney's transport infrastructure it will not, despite the claims made, be part of the London Underground tube network. It is an overground line. Nor will the ELLX restore Dalston's direct rail link to the City which closed in 1986. Nor does it run to the 2012 Olympic site at Stratford. The ELLX stations in Hackney will not be tube stations. Our local MPs, Councillors and others have been campaigning for years, if not decades, to connect Hackney to the London Underground tube network. The tube was what would finally put Hackney on the map. It is also seen as an essential element to regenerate an impoverised area. Whoever secured delivery of the tube in Hackney would be triumphant. But what if the agencies of Mayor Livingstone's Greater London Authority (GLA), with the cooperation of local politicians, could credibly present the ELLX as the arrival in Hackney of the tube? Who knows what price the public might be prepared to pay for such a prize and what rewards might be had by the authorities and local officials. This promotional image of the authorities plans for Dalston shows that they are guilty of a misrepresentation - Dalston Junction will not be a tube station. 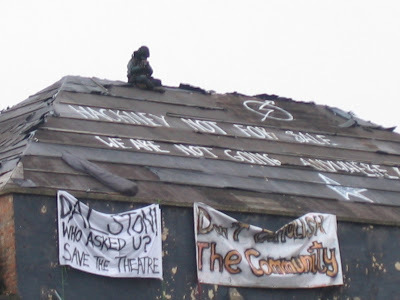 Sadly there are many more misrepresentations that have enabled officialdom to destroy historic Dalston, to betray their promises of affordable housing, to dispose for a peppercorn of public land worth £millions and to blight the local, and the wider, environment by gross and profligate overdevelopment. The planning permission and funding for the ELLX was already in place when TfL had the thought to construct a massive concrete slab spanning over the new railway station. TfL had identified the need to create a bus "turnaround" where some existing, and some new, bus routes from the north would terminate in Dalston and where passengers could interchange with the ELLX rail link. This would reduce bus miles and road congestion into the City. There was nowhere else, TfL said, to put the turnaround and so it is to be built on a concrete slab on top of the new railway station. The estimates for the cost of slab have risen to £39 million. At some £2.5 million per bus stand, and with a 15,000 tonnes carbon footprint, the slab will provide the most expensive bus turnaround in history. The £39 million cost to build the slab is to be subsidised by £10 million from the government and £10 million from TfL. It is the £19 million funding shortfall that has determined the form of development to be undertake on TfL's site and on Hackney Council's neighbouring site. The authorities planned to boost the sale value of their sites by first obtaining planning permission for "high revenue generating development". In TfL's case this meant residential tower blocks of up to 20 storeys with 309 private flats for sale, shops and commercial uses. But despite the £39 million public subsidy, and the authorities policies that 50% of new housing developments should be affordable, there is presently to be no public or affordable housing at all on the TfL site. The development was promoted by TfL and the London Development Agency (LDA) as “regeneration” inspired – “to create a critical mass of people with higher incomes” (Drivers Jonas) with “12 trains an hour to the City” (TfL) and an intention to attract national retailers. It was claimed that the development will bring prosperity for local people. Dalston would become a shopping destination. Each of the new housholds would spend £488 per week in the local area. These claims invite scepticism but undoubtably some people will become more prosperous as a result of this development. 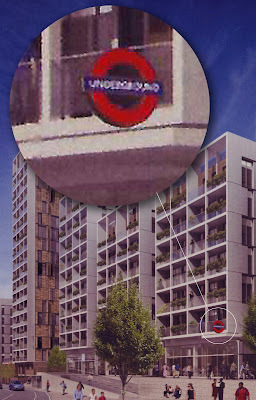 Dalston artists have decorated TfL's image of the development. TfL claimed that the development would be "beneficial in terms of landscape quality and visual impact", however the Council's own report described TfLs's buildings as “austere” and its proposed 20 storey skyscraper as “a stark concrete tower with punched openings for windows”. TfLs environmental consultants described how there will be 80 concrete lorries arriving every day for weeks in Dalston and how “during construction overshadowing and sunlighting losses will begin to occur as the development progresses”. OPEN, the Kingsland Conservation Area Advisory Committee, the De Beauvoir Association and many local residents objected to TfL's planning application at the time. The objections were to the mass and density of the development, the degraded design standards, the absence of any affordable housing, the loss of human scale to the environment, the profligate use of financial and natural resources and the inadequacy of the planned "open space". To some TfLs proposal appeared to be purely profit-led with scant regard to its environmental context - the crude imposition of a transport-hub to benefit TfL's business but which blights Dalston. To others it seemed to create a buy-to-let opportunity for absentee landlords which would result in families on housing benefit, with children, living up to the 20th floor on short-term tenacies - the re-building of the now demolished high-rise slums of old Holly Street estate. 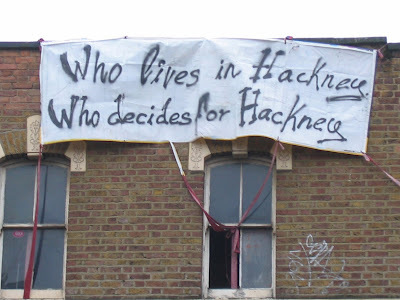 However our local elected politicians decribed it as progress, to bring the 21st century to Dalston, and the Hackney Council's Planning Committee granted TfL permission for the development in March 2006. TfL had told OPEN that there were no implications for Dalston's heritage architecture arising from its proposals. By that time, with the ELLX plans in place, it had already quietly demolished the original 1865 Dalston Junction station buildings. The hoardings have now been extended along Dalston Lane and further demolitions are planned and imminent - 2a Dalston Lane, with its decorative wall, curved glass windows and interior period detailing is next to go along with the Victorian house next door. The Victorian cottages in Roseberry Place have also it seems finally been purchased and now boarded up, soon to be demolished to create space to perhaps squeeze another block of flats onto TfL's site. The "air rights" to build on TfL's slab, have been offered to the major volume house-builder, Barratt. 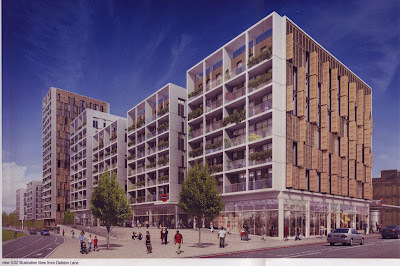 There is a recent local example of a Barratt development neighbouring Hackney's Town Hall square, on the strategic Richmond Road/Mare Street junction, which has been the subject of some controversy. The Council, as local planning authority, are responsibile for ensuring that Barratt will build in accordance with the approved detailed designs and materials. The head of Design for London("DfL"), Peter Bishop, has informed OPEN that DfL will also use its influence to ensure a quality outcome. At the time when the TfL scheme obtained planning approval, in March 2006, Hackney Council was developing a scheme for its neighbouring site on which stood historic buildings comprising a unique 1886 circus entrance, Dalston Theatre and two locally listed Georgian houses (their history is described here). In Spring 2005 TfL had already drawn up, at the Council's request, a masterplan for both sites in which Dalston's historic buildings had been replaced. In July 2005 the Council's members had been presented with a Planning Brief for the sites to which agreement was essential, it was said, "to ensure the delivery of the East London Line Project...failure to agree the brief will impact on the delivery of the station by 2010". Any threat to Dalston's "tube" was politically unacceptable. Councillors were required to approve "maximising the development potential" of both sites which were considered suitable for tall buildings to a "maximum of 12-15 storeys" with a target of "50% affordable housing". Although the Brief referred to the possibility of demolition, a seperate report referred to the Council's commitment to demolition. The Brief stated that the two developments would be"complementary" but the plans for the Council's and TfL's developments were not presented side-by-side during the public consultation until an OPEN public meeting in November 2005. There was uproar when the architects drawings were produced. Dalston Lane's historic buildings were now on the footprint of a proposed 20 storey tower block. They were, in effect, on death row awaiting demolition. 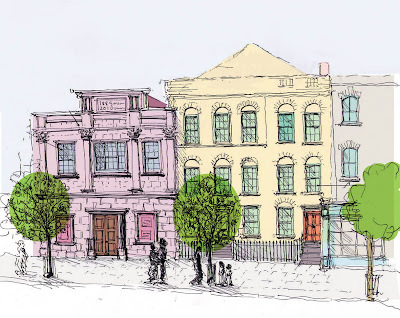 The Council made a planning application to itself and, in the face of objections and demonstrations at the Town Hall by the local community, its Planning Committee voted in February 2006 to demolish all the historic buildings. The decision to proceed with demolitions was not however to be taken by our elected policitians but, once again, by a few Council officials. In March the Council's Chief Executive identified a situation of "extreme urgency" to justify authorising funds for implementing the demolition contract (the costs of which were to be reimbursed by the LDA). The community's awareness and objections to the plans were growing. TfL announced in June that, in the light of the consultation "TfL will meet the costs of the rail station and the bus station" and that the development plans had been modified - the overall density of the two sites had been reduced from 800 to less than 600 flats. The density of the Council's scheme was now for 244 flats, in blocks of up to 20 storeys. But of the 550 flats to be built on both sites only 58, and not 50%, were to be affordable. The rest are, presently, all planned for sale. 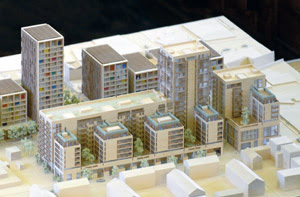 The LDA produced a model of the two schemes and in March 2006 made an application to the Council for planning permission to demolish all the buildings on the Council's site and build towerblocks. Despite overwhelming objections from the community the application was granted by the Council's Planning Committee in July 2006. The purpose of constructing a massive concrete slab over the new ELLX Dalston Junction station is to provide a bus turnaround to benefit TfL's business and London wide commuters. However evidence emerged that the £19 million shortfall on the cost of TfL's slab is not to be met by the Greater London Authority(GLA), nor by its agencies TfL and the LDA, but by Hackney Council's taxpayers. The most money to be made would be from a flattened Council site with permission for a high-rise high-density development with the bare minimum of affordable housing. This is what TfL and the LDA required and what Hackney Council agreed to and has now delivered. It remains to include the Council's site in the LDA's deal with Barrat, the proposed developer of both sites. In return for the disposal of a 125 year lease of its site the Council will get only four empty floors of a towerblock (for a new library)from the developer and the true market value of the site will be used to subsidise the GLA's slab. (See here- Greater London Authority mugs Hackney. Dalston blighted). Whilst TfL had informed OPEN that it's scheme had no heritage implications, the reverse in fact was true - the demolition of Dalston's historic buildings was a key to subsisiding TfL's slab. As the LDA was to inform the High Court in September 2006 "the development is not possible without demolition...the LDA would have insufficient funds..to fund the slab shortfall of £19 million... failure to undertake the demolition will lead to the abandonment of the existing proposals for the Dalston Project...the opportunity to build the slab will be missed". The Secretary of State was asked to consider the schemes and decided on 9th November 2006 that "any loss of [Dalston's historic buildings]..can not be given particular weight...noted the design of the proposed buildings and the level of affordable housing.....has concluded that there is not sufficient conflict with national planning policies, or any sufficient reason, to warrant calling in the application.."
Since December 2005 OPEN had obtained a series of injunctions in the High Court to restrain the Council from demolishing the buildings whilst seeking to persuade the authorities to reconsider and retain something of Dalston's history and character. The Council acknowledged that it had never considered whether the historic buildings could be retained as part of the plans. OPEN's application for judicial review finally came before a Judge on 29 November 2006. The Judge found that the Council has a very wide discretion in dealing with its property - it was entitled to depart from its policies aimed to protect historic buildings and need not consider an alternative scheme for the site to incorporate them, or even asses their viability for re-use, particularly where there was an approved redevelopment scheme in existance. The way was clear for the demolitions and these began in February 2007 - the links below tell the story. How it was - despite the years of deliberate neglect by Hackney Council, the buildings had survived: the pair of 1820's Georgian houses, the original 1886 circus entrance, the 1898 Theatre Entrance in front of it (aka The Four Aces Club) and the Dalston Theatre behind. "There is absolutely no doubt, based on my experience, that (these buildings)can be satisfactorily brought back to a situation where they can be reused. My experience suggests that repair will not be excessively expensive." How it is today - destroyed by Hackney Council with the approval and agreement of Transport for London, the London Development Agency, the Greater London Authority and the Secretary of State. The Vandals: an eastern Germanic tribe which earned notoriety by it sacking Rome in the 5th century but which was defeated by the Goths.